Book Club members were busy this term shadowing the shortlisted books for the Blue Peter Book award. They had three fiction and three non-fiction books to read before voting on their choice of winner in each category. The House with Chicken Legs, Sophie Anderson. The Clockwork Crow, Catherine Fisher. The Boy at The Back of the Class, Onjali K. Rauf. The Element in the Room, Mike Barfield. Colours of History, Clive Gifford. Human Body Odyssey, Dr. Dominic Walliman and Ben Newman. They voted for The House with Chicken Legs and The Element in the Room. The Blue Peter winners were, The Boy at The Back of The Class and Colours of History. We had some really intense discussions before voting for our winners and felt that all these books were extremely good. 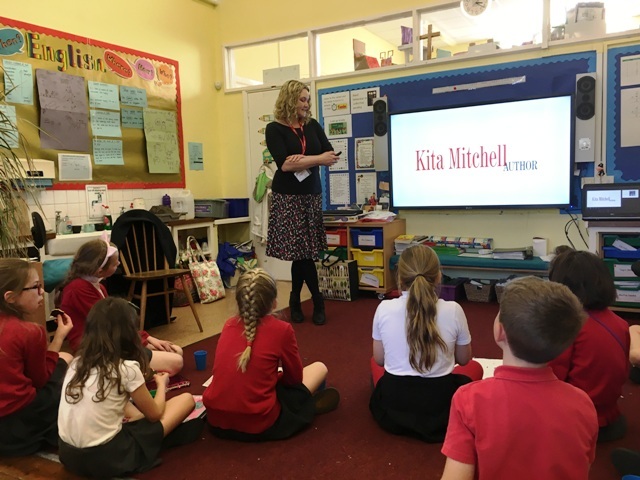 We were very lucky to have a visit from a local author, Kita Mitchell, who has just had two brilliant books published; Grandma Dangerous and the Dog of Destiny, and Grandma Dangerous and the Egg of Glory. She gave us a great insight into how to write books and what inspired her. Her first rejection from a publisher was at the age of seven, and she encouraged all our would-be authors to keep going if they wanted to be writers. She was very entertaining and we really enjoyed listening to her.